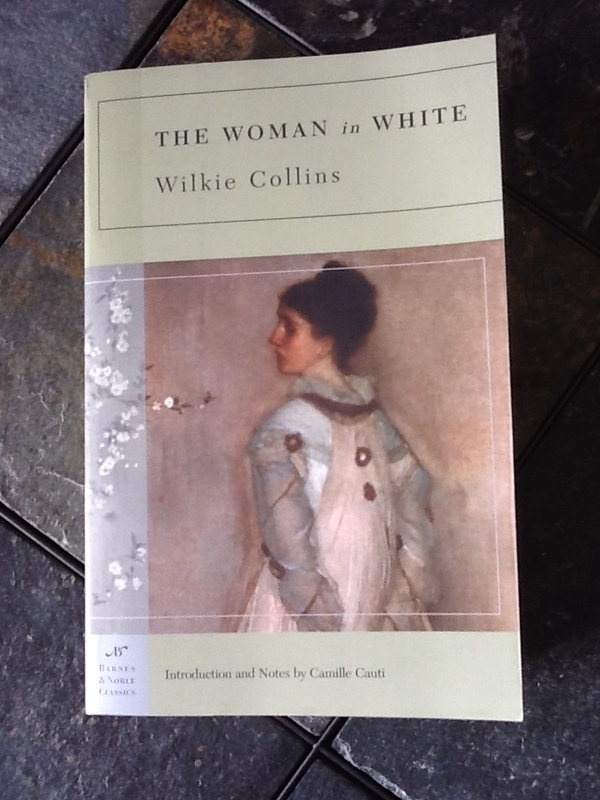 Killing the Book Club: The Woman in White – The Bookshelf of Emily J.
I killed the book club my sisters and I had by suggesting that we read The Woman in White (1860) by Wilkie Collins, number 45 on the BBC book list. It is a long novel (617 pages) and a Victorian Novel. Therefore, reading it is daunting and takes persistence. I ultimately enjoyed it, but I could understand why my sisters did not read it and why we no longer have a book club. Maybe we need to start that up again. Anyway, I persisted in reading it because of my friend Amy. For years, she had told me how great it was. If she had read it and loved it, I wanted to read it and love it too. I look up to her. She’s smart, she’s hip, she’s talented, and she has great taste. So, I read it. As soon as I finished, I spoke with Amy about it. It was then I realized that all of her gushing over The Woman in White had been about the movie version, not the book. That made me laugh. She hadn’t read it at all. But I’m glad I was mistaken so that I read it. It was worth the read. The book is an epistolary novel, which has a different writing style for each section. The narrators change often and will go from writing in their journals to composing letters. Seeing the mysterious story from all of these viewpoints makes it complete and compelling. The novel almost becomes a trial in a court of law, with all of the players presenting their side of the story or their evidence. My favorite character by far is Count Fosco. He’s a bad guy, but he’s a hilarious bad guy. He’s smarmy, obese, quick-witted, and obnoxious. There were times that I wanted to reach into the book and smack him. There were other times that I wanted to pull him out of the book and put him on Saturday Night Live. My favorite scene with Count Fosco is when he takes part in giving his own side of the story. He writes his own confession in a torrent that lasts hours, throwing paper about with noisy delight. He says, “Habits of literary composition are perfectly familiar to me. One of the rarest of all the intellectual accomplishments that a man can possess is the grand faculty of arranging his ideas. Immense privilege! I possess it. Do you?” (583). Collins then describes Fosco’s writing process in great detail, a scene that appeals to this teacher of writing. Fosco, although a bad guy, recognizes the importance of writing and uses it as a way of competing intellectually. It is another way for him to show how much smarter he is than everybody, although I’m not sure his hubris is justified since his plan doesn’t pan out. The part of the story from which the title is derived is somewhat mysterious, but not all that scary. When I think of a woman in white, I assume it’s a ghost. And yes, that’s what this woman in white appears to be in the novel. There are some intriguing scenes with this phantom woman. It is her story that is most central to the plot. All of the narratives solve her mystery and allow the reader to understand who she is. It’s a fascinating, but slow, mystery. I recommend The Woman in White. It’s worth the time it takes to read it. And, my friend Amy recommends the movie version of The Woman in White. I plan on seeing it soon. Glad you enjoyed it! I too read it for a book club. I was really freaked out by the size but ultimately enjoyed it. It is intimidating, but like you said, worth it! Killing the book club is a genius title for a book–or a film or a collection of memoirs. I think i tried to read Woman in White once but quit, this inspired me to try again. Lovely post! Pingback: How Would You Live If Your Child Were Still Missing? | The Bookshelf of Emily J.
Pingback: My Blogging Process | The Bookshelf of Emily J.